In our modern and continuous changing environment, especially in agriculture, it is very important for our modern-day farmer, big or small, to be financially literate. Therefore, in our next couple of articles we will focus on financial literacy. To kick of the discussion, we will commence with the focus on an Income Statement or now known as the Statement of Financial Performance. 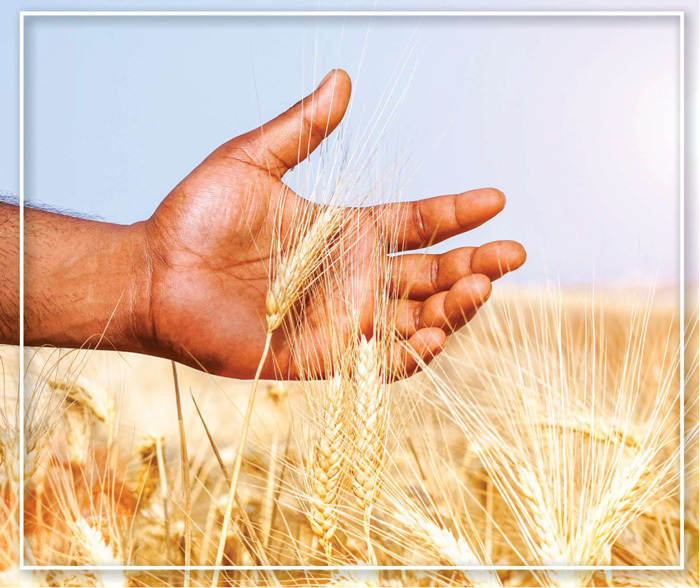 We have numerous times stated in the articles that it is important to farm profitable in a sustainable manner. That is the main objective of any business. When you are making a profit, your financial performance is positive. The only way to determine accurately whether you are making a profit is to compile a Statement of Financial Performance. But remember, when you have money in the bank, it does not necessarily mean you are making a sustainable profit. Secondly, do not depend on a bookkeeper to compile this statement. Bookkeepers compile a statement in view of complying with tax requirements, which is a different matter. Thirdly, to compile the statement accurately, you need accurate information. And lastly, you must keep your personal expenses separate from your business. See yourself as an employer of the business and pay yourself a salary from the business. If possible, it is highly advisable to even have two separate bank accounts. You will now understand to compile the statement, information is needed – source documents – such as invoices, bank statements, marketing statements, a stock register, own records for consumption, and so forth. You will also note a few non-cash (there were no flow of actual cash) items are included – credit sales, consumption figures and depreciation. Note that the value of production cost must be the actual value used and not what was purchased. For instance, you have bought 100 bags of fertiliser but have only used 90 bags. Only the actual cost of the 90 bags used must be reflected in the statement and not the purchase price of the 100 bags. The costs mentioned are only examples, there are many more costs and will differ from farm to farm. Accurate information will assist in compiling an accurate statement which will provide you with information to manage your business properly. You can only use a cost as a production cost if you are able to allocate the cost directly to a specific enterprise, such as the examples used. Any cost that cannot be allocated directly to an enterprise must rather be regarded as an overhead cost. Such as telephone costs – are you able to specify that a call you made to the supplier of inputs was only regarding maize? Let’s concentrate on the important terms reflected in the statement. 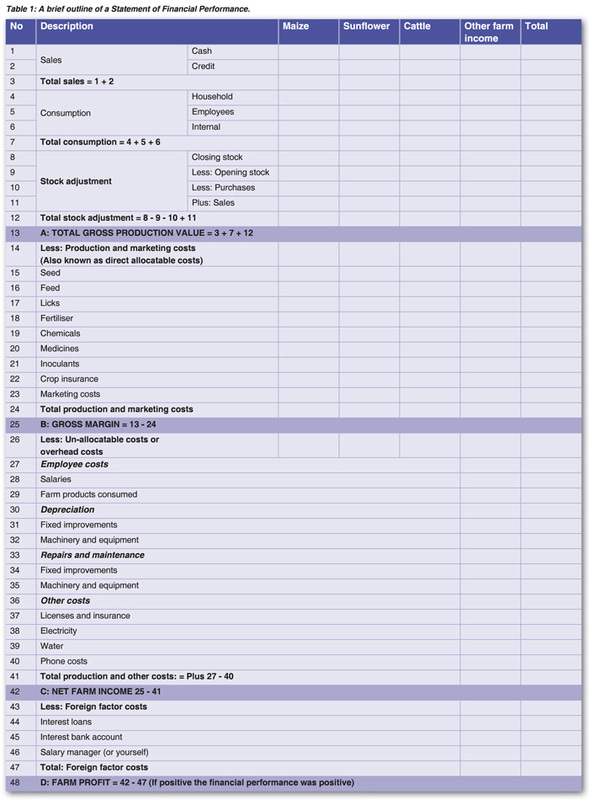 First – Gross Production Value (A). This term reflects an accurate figure of everything produced on your farm because it includes the value of all products marketed and used on the farm. Secondly Gross Margin (B) – a very important term. Note that the statement is designed in such a way that the gross margin for each enterprise on the farm is determined. If the gross margin of say the sunflower is negative (all production and marketing costs are not covered) you have information to manage the position. You must consider why is it negative (there was a hailstorm which is beyond your control) or was your production methods not up to standard? Then you can decide in a logical way should you continue producing sunflower by improving your production methods or consider a different crop. Furthermore, should the gross margin of an enterprise be negative it means the sunflower crop does not make any contribution to covering all the other overhead costs. This means the other enterprises are subsidising the sunflower crop. Is this a viable situation? A very important term is C – the Net Farm Income. When reflecting to our previous article ‘How to apply for a loan?’ – this is a figure a financial institution will also consider when considering a loan application. You will realise if this figure is positive they will consider your application positively and vice versa, if it is negative your application will be considered very cautiously. Should you be able to pay all foreign factor costs, then only it can be stated that your farming business is making a real profit, or you have a positive financial performance. This is then reflected as D – Farm Profit. In conclusion, a farmer of today must be financially literate. If not, get help or attend a course. You must be able to interpret the information included in a statement of financial performance to make sound management decisions if you wish to continue farming in this modern era. Article submitted by Marius Greyling, Pula Mvula contributor. For more information, send an email to mariusg@mcgacc.co.za.